Climate, Food and Farming - Global Research Alliance Development Scholarships (CLIFF-GRADS) is a joint initiative of CCAFS low emissions development research and the Global Research Alliance on Agricultural Greenhouse Gases (GRA). Support is provided by CGIAR Trust Fund and bilateral donors to CCAFS, as well as the governments of New Zealand and the United States. CLIFF-GRADS builds the capability of early-career scientists and graduate students from developing countries to conduct applied research on climate change mitigation in agriculture with the goal of expanding knowledge and experience in quantification of agricultural greenhouse gases and food loss and waste. During their tenure at the host institutions, grant recipients learn to evaluate agriculture-related options for reducing GHG emissions and consider productivity and livelihood consequences. The techniques studied may include (but are not limited to) remote sensing, economic surveys, and measurement of greenhouse gas emissions. Topics depend on the students' and host institutions' interests. CLIFF-GRADS also generates novel climate change research on smallholder farming systems and facilitates South-South knowledge exchange. Since 2011, a large number of students have received grants and have gone on to hold important positions in research institutions and governments. In recognition of the importance for gender equity in science and policy-making, CLIFF-GRADS aims to award at least half of all fellowships to women. Just how smart are the climate smart options promoted in the Climate Smart Villages of Nicaragua? Quantifying GHG emissions of agrifood chain and associated food loss and food waste in China: an input-output analysis. Effects of organic matter soil amendments on population dynamics of Aspergillus flavus and its natural antagonists; and on groundnut aflatoxin contamination in Malawi. Understanding smallholder farmers' storage habits in Malawi. Arias-Navarro C, Díaz-Pinés E, Kieseb R, Rosenstock TS, Rufino MC, Stern D, Neufeldt H, Verchot LV, Butterbach-Bahl K. 2013. Gas pooling: a sampling technique to overcome spatial heterogeneity of soil carbon dioxide and nitrous oxide fluxes. Soil Biology and Biochemistry 67: 20–23. Arias-Navarro C, Díaz-Pinés E, Klatt S, Brandt P, Rufino MC, Butterbach-Bahl K, Verchot LV. 2017. Spatial variability of soil N2O and CO2 fluxes in different topographic positions in a tropical montane forest in Kenya. Journal of Geophysical Research: Biogeosciences, 122:514-527. Carvalho MTM, Madari BE, Leal WGO, Costa AR, Machado PLOA, Silveira PM, Moreira JAA, Heinemann AB. 2013. Nitrogen fluxes from irrigated common‑bean as affected by mulching and mineral fertilization. Pesquisa Agropecuária Brasileira, 48(5): 478-486. Choudhary M, Datta A, Jat HS, Yadav AK, Gathala MK, Sapkota TB, Das AD, Sharma PC, Jat ML, Singh R, Ladha JK. 2018. Changes in soil biology under conservation agriculture based sustainable intensification of cereal systems in Indo-Gangetic Plains. Geoderma, 313: 193-204. Choudhary M, Jat HS, Datta A, Yadav AK, Sapkota TB, Mondal S, Meena RP, Sharma PC, Jat ML. 2018. Sustainable intensification influences soil quality, biota, and productivity in cereal-based agroecosystems. Applied Soil Ecology, 126:189-198. Ding L, Wang C, Lu Q, Yan Z, Shi Z. 2013. Effects of Configuration and Head Space Wind Profile on the Performances of Flux Chambers in Gas Emission Measurement: A Laboratory Study. American Society of Agricultural and Biological Engineers. Paper Number 131619989. Kansas City, Missouri, USA. Goopy JP, Onyango A, Dickhoefer U, Butterbach-Bahl K. A new approach for improving emission factors for enteric methane emissions of cattle in smallholder systems of East Africa – Results for Nyando, Western Kenya. Agricultural Systems. Goopy JP, Pelster DE, Onyango A, Marshall K, Lukuyu M. 2017. Simple and robust algorithms to estimate liveweight in African smallholder cattle. Animal Production Science. Guarnacci, U. 2012 Governance for sustainable reconstruction after disasters: Lessons from Nias, Indonesia. Environmental Development, 2:73-85. Guarnacci U. 2016. Joining the dots: Social networks and community resilience in post-conflict, post-disaster Indonesia. International Journal of Disaster Risk Reduction, 16:180-191. Heve WK, Olesen J, Chirinda N, Adiku S. 2015. Targeted management of organic resources for sustainably increasing soil organic carbon: observations and perspectives for resource use and climate adaptations in northern Ghana. Acta Agriculturae Scandinavica, Section B — Soil & Plant Science. Kansiime KM, Shisanya AC, Wambugu KS. 2014. Effectiveness of technological options for minimising production risks under variable climateic conditions in eastern Uganda. African Crop Science Journal, 22s4: 859-974. Kansiime MK, Wambugu SK, Shisanya CA. 2013. Perceived and actual rainfall trends and variability in Eastern Uganda: implications for community preparedness and response. Journal of Natural Sciences Research, 3(8). Marin A, Baldissera T, Pinto C, Garagorry F, Zubieta A, Giraldo LA, Chirinda N, Arango J, Carvalho P. 2017. Grazing management innovation as a strategy to improve animal production and reduce GHG emissions. (Spanish: Una innovación en el manejo del pastoreo como estrategia para mejorar la producción animal y reducir las emisiones de GEI). CCAFS Info Note. Wageningen, the Netherlands: CGIAR Research Program on Climate Change, Agriculture and Food Security (CCAFS). Mujuru L, Gotora T, Velthorst EJ, Nyamangara J, Hoosbeek MR. 2013. Soil carbon and nitrogen sequestration over an age sequence of Pinus patula plantations in Zimbabwean Eastern Highlands. Forest Ecology and Management, 313, 254–265. Mujuru L, Mureva A, Velthorst, EJ, Hoosbeek MR. 2013. Land use and management effects on soil organic matter fractions in Rhodic Ferralsols and Haplic Arenosols in Bindura and Shamva districts of Zimbabwe. Geoderma, 209-210, 262–272. Mujuru L, Rusinamhhodzi L, Nyamangara J, Hoosbeek MR. 2015. Effects of nitrogen fertilizer and manure application on storage of carbon and nitrogen under continuous maize cropping in Arenosols and Luvisols of Zimbabwe. The Journal of Agricultural Science. Musyimi, Z., Said, M.Y., Zida, D., Rosenstock, T.S., Udelhoven, T., Savadogo, P., Leeuw, J. de and Aynekulu, E. 2017. Evaluating fire severity in Sudanian ecosystems of Burkina Faso using Landsat 8 satellite images. Journal of Arid Environments, 139: 95–109. Nyamadzawo G, Shi Y, Chirinda N, Oleson J, Mapanda F, Wuta M, Wu W, Meng F, Oelofse M, de Neergaard A, Smith J. 2014. Combining organic and inorganic nitrogen fertilisation reduces N2O emissions from cereal crops: a comparative analysis of China and Zimbabwe. Mitigation and Adaptation Strategies for Global Change. Nyamadzawo G, Wuta M, Chirinda N, Smith JL. 2013. An estimation of greenhouse gas emissions from seasonal wetland (dambo) rice in Chiota smallholder farming area of Zimbabwe. Atmospheric Climate Sciences, 3:13-20. Nyamazawo G, Wuta M, Nyamangara J, Nyamugafata P, Chirinda N. 2014. Optimizing dambo (seasonal wetland) cultivation for climate change adaptation and sustainable crop production in the smallholder farming areas of Zimbabwe. International Journal of Agricultural Sustainability. Nyamazawo G, Wuta M, Nyamangara J, Smith JL, Rees RM. 2014. Nitrous oxide and methane emissions from cultivated seasonal wetland (dambo) soils with inorganic, organic and integrated nutrient management. Nutrient Cycling in Agroecosystems. Nyamadzawo G, Wuta M, Nyamangara J,Rees R, Smith J. 2014. The effects of catena positions on greenhouse gas emissions along a seasonal wetland (dambo) transect in tropical Zimbabwe. Archives of Agronomy and Soil Science. Onyango A, Dickhoefer U, Butterbach-Bahl K, Goopy J. 2016. Digestibility and metabolizable energy of selected tropical feedstuffs estimated by in vitro and prediction equations. Poster prepared for the Tropentag 2016 Conference on Solidarity in a Competing World. Onyango AA, Dickhoefer U, Rufino MC, Butterbach-Bahl K, Goopy JP. 2018. Temporal and spatial variability in the nutritive value of pasture vegetation and supplement feedstuffs for domestic ruminants in western Kenya. Asian-Australasian Journal of Animal Sciences. Rahman N, Bruun TB, Giller KE, Magid J, van de Ven G, de Neergaard A. 2019. Soil greenhouse gas emissions from inorganic fertilisers and recycled oil palm waste products on Indonesian oil palm plantations. Global Change Biology. Vu Q, de Neergaard A, Tran T, Hoang Q, Ly P, Tran T, Jensen L. 2015. Manure, biogas digestate and crop residue management affects methane gas emissions from rice paddy fields on Vietnamese smallholder livestock farms. Nutrient Cycling in Agroecosystems, 103:329–346. Vu QD, de Neergaard A, Tran TD, Hoang HTT, Vu VTK, Jensen LS. 2014. Greenhouse gas emissions from passive composting of manure and digestate with crop residuesbiochar on small-scale livestock farms in Vietnam. Environmental Technology. Vo TBT, Wassmann R, Tirol-Padre R, Cao VP, MacDonald B, Espaldon MVO, Sander BO. 2017. Methane emission from rice cultivation in different agro-ecological zones of the Mekong river delta: seasonal patterns and emission factors for baseline water management. Soil Science and Plant Nutrition. Wanyama I, Pelster DE, Arias-Navarro C, Butterbach-Bahl K, Verchot LV, Rufino MC. 2018. Management intensity controls soil N2O fluxes in an Afromontane ecosystem. Science of the Total Environment, 624: 769-780. Wanyama I, Rufino MC, Pelster DE, Wanyama G, Atzberger C, van Asten P, Verchot LV, Butterbach-Bahl K. 2018. Land-use, land-use history and soil type affect soil greenhouse gas fluxes from agricultural landscapes of the East African highlands. Journal of Geophysical Research: Biogeosciences,123(3): 976-990. Wassmann R, Alberto MC, Tirol-Padre A, Hoang NT, Romasanta R, Centeno CA, Ole Sander B. 2018. Increasing sensitivity of methane emission measurements in rice through deployment of ‘closed chambers’ at nighttime. PLoS ONE, 13(2). Yusuf HM, Treydte AC, Sauerborn J. 2015. Managing semi-arid rangelands for carbon storage: Grazing and wood encroachment effects on soil carbon and nitrogen. PLoS ONE, 10(10): e0109063. Reducing agriculture emissions while maintaining yields - can it be done? Beginning in 2018, funding for CLIFF-GRADS is provided by the CGIAR Research Program on Climate Change, Agriculture and Food Security (CCAFS) with support from CCAFS and the Global Research Alliance on Agricultural Greenhouse Gases (GRA) with support from the Government of New Zealand. Funding for research in food loss and waste is supported by CCAFS donors and the United States government through USAID. From 2011-2017, the CGIAR Research Program on Climate Change, Agriculture and Food Security (CCAFS) administered CLIFF in collaboration with the Department of Agriculture and Ecology of the University of Copenhagen and the Department of Agroecology at Aarhus University. CLIFF-GRADS: This work was undertaken as part of the Climate, Food and Farming and Global Research Alliance Development Scholarships (CLIFF-GRADS) program, an initiative implemented by the CGIAR Research Program on Climate Change, Agriculture and Food Security (CCAFS) and the Global Research Alliance on Agricultural Greenhouse Gases (GRA) with support from their donors. CLIFF Network: This work was undertaken as part of the Climate, Food and Farming (CLIFF) Network, an initiative of the CGIAR Research Program on Climate Change, Agriculture and Food Security (CCAFS). CCAFS is carried out with support from the CGIAR Trust Fund and through bilateral funding agreements. For details please visit https://ccafs.cgiar.org/donors. CCAFS is pleased to announce the 2018 CLIFF-GRADS recipients. Sebastián Vangeli National Institute of Agricultural Technology, Argentina, and Bangor University Impact of agricultural management on nitrous oxide emissions and mitigation potential. Ridha Ibidhi Mediterranean Institute for Agricultural Economics of Zaragoza, Tunisia and Bangor University Nutrition strategies, manipulation and management for the reduction of the greenhouse gas emissions in the production of dairy and beef cattle. Banira Lombardi National University of the Center of the Province of Buenos Aires, Argentina and CIAT Quantification of greenhouse gases (GHG) from livestock effluents in typical Argentine production systems. Prior to 2018, Climate Food and Farming (CLIFF) Research Network grants were funded solely by CCAFS and selected doctoral students to work with CGIAR researchers affiliated with the Standard Assessment of Mitigation Potential and Livelihoods in Smallholder Systems (SAMPLES) project. In 2016-2017, the following people were awarded CLIFF grants. *Alejandra Marín Gómez was recently commended by National University of Colombia for her participation in COP23. In 2014-2015, the following people received CLIFF grants. 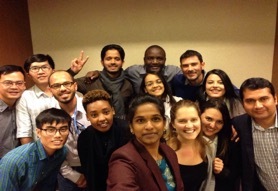 Read more about the launch of this cohort, held in Montpellier to allow students to attend the Global Science Conference on Climate Smart Agriculture. CLIFF recipients will spend 3-4 months at CGIAR centers, working with scientists affiliated with the Standard Assessment of Mitigation Potential and Livelihoods in Smallholder Systems (SAMPLES) project, where they will learn research principles and methods applicable to their own PhD research. The 2013-2014 cohort members of CLIFF are listed in the following table. Eight grant winners kicked off 2013-2014 CLIFF activities with an orientation workshop 1-4 December 2013 at Aarhus University-Foulum in Denmark. At the workshop, the grantees presented their proposed PhD research for critique. 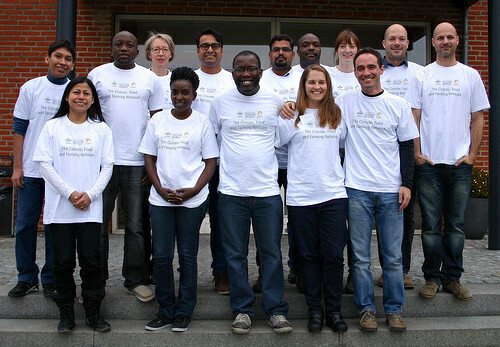 CLIFF 2013-2014 GRANT RECIPIENTS WITH CCAFS AND AARHUS PARTNERS AT AARHUS, DENMARK.